from Velo/380 (stamping machines of 1940 are still currently in operation, regularly supplied by us with spare parts and service) to Velo/600, Velo/1000 and Velo/1200; of course, like any good story it could not but go well and here is the new Velo/1400. research and constant innovation on materials to enhance the durability of the machine. constant interfacing with the pasta factories to identify their problems and improve machinery each quarter. 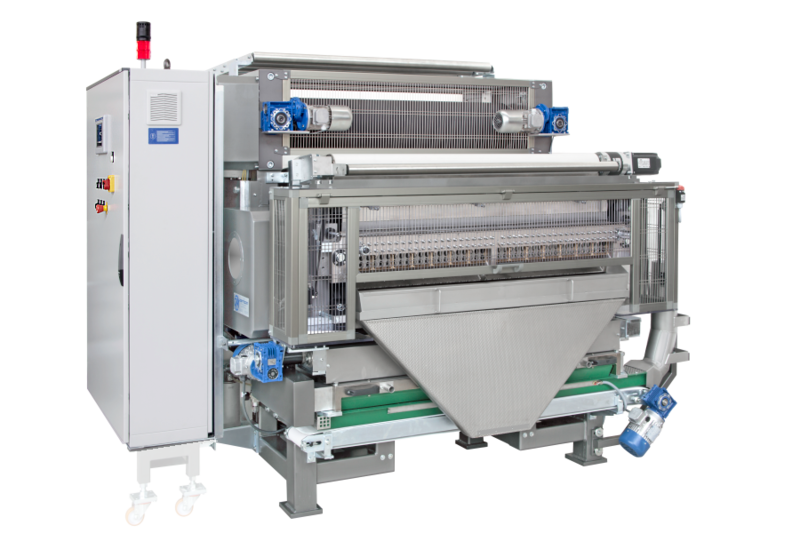 Its production potential is such as to ensure, for example, 900 kg / h of dry product with the butterfly (farfalle) 65B or 1100 kg/h for the "orecchiette ". The construction layout offers reduced overall dimensions and realization of right or left stamping machines: therefore, they can be coupled without the need of having to leave space between them. To save space, the electrical panel (touch screen, inverter and PLC) is integrated in the overall dimensions of the machine itself (in the case of machinery with Allen Bradley the electrical panel remains outside as in the photo). The versions with grooved cylinder have the possibility of moving from the calibration with the smooth cylinders in that with grooved cylinders, without having to change or displace any piece. The basic mechanical concepts are not touched, so there is still the elastic system for operating the group of shaping fingers, with four upper, and four lower, push points to obtain the perfect closing of the “farfalle” along the entire width of the mold. The completely revamped cutting device for scraps is now powered independently and synchronized with the movement of the dough-sheet for longitudinal cutting. As an option, the cross cutting device to further decrease the size of the scraps to be re-mixed, thus increasing the homogeneity between the new dough and the scraps. Through encoder the thickness control of the dough-sheet with the ability to set and retrieve 50 shapes with all their operating parameters: thickness of calibration, rolling speed, speed of machine etc. Fully refurbished the unit for the production of Noodle and the conveyors to load the pasta shaker. More and more new shapes are still added to the already available wide range to increase the fantasy of Pasta Bologna.